We did not take breakfast as we needed to leave early but the staff are very welcoming and the location is ideal from our point of view. Very large room with all the amenities. Great location by the seafront. Good buffet breakfast next door. Nice menu in the restaurant next door. Adequate breakfast. Location was great and came in a timely manner for us being tired travelers we appreciated it very much. I had a dental problem, and the staff very kindly helped me to find a dentist for a couple of hours afterwards, who solved the problem perfectly. This really saved my journey. good value for money , cheap end hotel but perfectly comfortable , like the restaurant also . 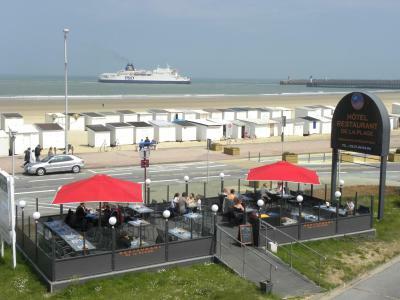 Adjoining Hotel de la Plage restaurant great food and value for money. Excellent value for money. All rooms being updated but clean and comfortable. 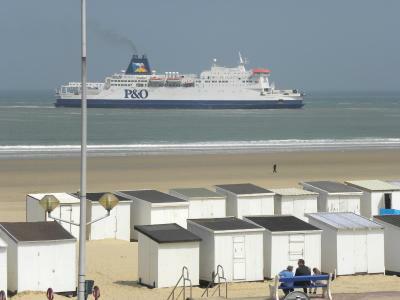 Located across from the beach at Calais, only half a mile from the center of town, this hotel is near the ferry terminal and has well-equipped accommodations sleeping up to 4 people. Many of the peaceful rooms at the Hôtel Résidence du Golf offer a partial view of the sea. The rooms include free Wi-Fi, satellite TV with French and English channels, and a full private bathroom. A kitchenette with a microwave and fridge is available. Dishes and cooking equipment can be rented for a fee. A bar and restaurant are available next door. The Channel Tunnel is only 5 minutes from the Hôtel Résidence du Golf. The property provides 80 parking places and 5 of them are suitable for guests with reduced mobility. When would you like to stay at Hôtel Résidence du Golf? This room has a TV with satellite channels and features a kitchenette with a microwave, a refrigerator and a teakettle. The private bathroom with a bathtub comes with a hairdryer. This room has a TV with satellite channels. It features sea views and a kitchenette with a microwave, a refrigerator and a teakettle. The private bathroom with a bathtub includes a hairdryer. House Rules Hôtel Résidence du Golf takes special requests – add in the next step! Hôtel Résidence du Golf accepts these cards and reserves the right to temporarily hold an amount prior to arrival. Please note baby cots are on demand only and have to be confirmed by the hotel. Some rooms are specially adapted for guests with limited mobility. Please note that these are only available in the double rooms. If you plan on arriving after 22:00, please inform the property in advance in order to get an access code. Please inform Hôtel Résidence du Golf of your expected arrival time in advance. You can use the Special Requests box when booking, or contact the property directly using the contact details in your confirmation. Kitchen cupboard doors were loose. Virtually no complementary toilet rolls 🥴. Excellent bathroom and good space. There was no cooking utensils, pans, plates knives and forks etc. No Hairdryer. I had to ask for all of these things but they were provided quickly. the noise in the hotel was ridiculous from other residents and he police. deliveries at 5am to the restaurant noisy and lengthily. the beds are concrete. the hotel has a lot of potential that isn't utilized. Its a shame really. The extent of the police presence in the hotel and restaurant was too much. at one point we were surrounded by about 20 guns and it was disconcerting. The location was good and the parking facilities. the fridge and cooking area is good and handy. the hotel has a lot of potential but for some reason isn't utilized. our room - family room has a kitchenette, which was lovely, but no any cutlery, which cause some inconvenience. Especially for family with small children. Close to the beach and ferry terminal. Extremely friendly and helpful staff. Trying to charge me twice. Even more than for the stay. The actual rooms do lack a little maintenance with a socket hanging off the wall in the bedroom and it looked like the skirt board in the toilet had been removed (as there was obvious signs of glue) but never replaced. Just 4 sachets of tea and coffee. Not enough if you want more through the day. Also no mugs, only plastic cups which are hard to hold. Some of the electric sockets did not work and there was no "subtle" lighting in the room! Breakfast was very good and reasonably priced. It was excellent having our own kitchen and the view was brilliant! Great family room, very convenient for the late shuttle.